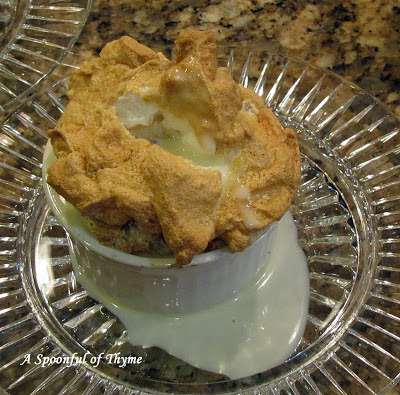 When I was searching for a dessert to accompany our Mardi Gras menu, I was immediately drawn to the Bread Pudding Soufflé with Whiskey Sauce recipe that I found in Lee Bailey's New Orleans Good Food and Glorious Houses. He teamed up with Ella Brennan and created numerous menus with elegant foods set in fabulous New Orleans homes....what a tour....and what a dessert....intriguing...bread pudding and soufflé...an interesting combination but one worth exploring! It requires three elements: bread pudding, meringue, and sauce. All three sound good to me!! Make the bread pudding: Preheat the oven to 350° F. Grease an 8 X 8-inch pan. Mix the sugar, cinnamon, and nutmeg in a large bowl. Beat in the egg and egg white, then stir in the half and half and the vanilla. Add bread and raisins and stir. Pour into prepared pan and bake until lightly browned and a toothpick comes out clean, about 45 minutes. Cool. Make the sauce: Whisk together the cornstarch and water. In a small saucepan over medium heat, bring cream to a boil. Add cornstarch mixture, whisking vigorously. Let mixture return to a boil. Then remove from heat and stir in sugar and bourbon. Allow to cool, then refrigerate. Make the meringue: Preheat oven to 350° F. Butter 6 individual 1/2-cup custard cups. In a large bowl, whip the egg whites until foamy. Continue to whip, adding sugar gradually, until shiny and thick. In a large bowl, break half the bread pudding into small bits, using a large spoon or your hands, (Reserve the remaining half of the bread pudding for another time.) and gently stir in half the meringue. Then fold in half of the remaining meringue, reserving the rest. Spoon the mixture into the prepared cups and top each with a swirl of the reserved meringue. Bake in a water bath until tops are golden, about 20 minutes. To serve, warm the Whiskey Sauce in a double boiler. 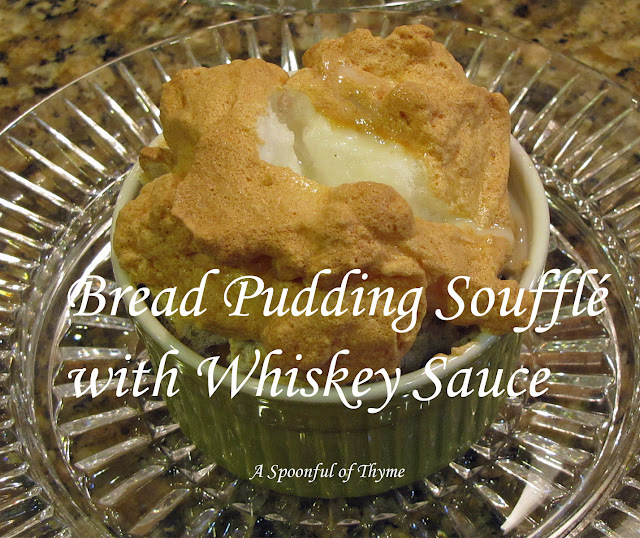 Poke down the tops of the soufflés and spoon in a bit of the sauce. All I can say is....heavenly....so delicious....a perfect dessert for a special dinner!! I am sharing today at Full Plate Thursday hosted by Miz Helen's Country Cottage, Foodie Friday hosted by Michael at Rattlebridge Farm, and at Saturday Spotlight hosted at Angel's Homestead. 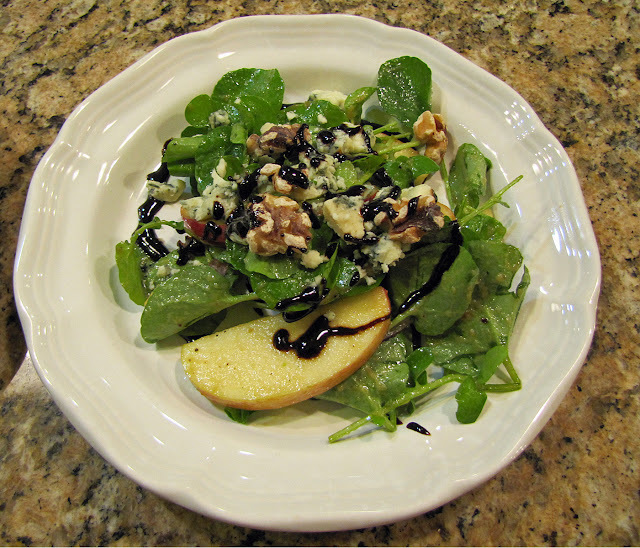 This elegant winter salad was a wonderful light first course at our gourmet group's dinner. It was a perfect start before our heartier winter entreé, Shrimp Creole. The dressing is lightened with roasted and puréed apple and onion and then finished with a reduction of balsamic vinegar...delicious! 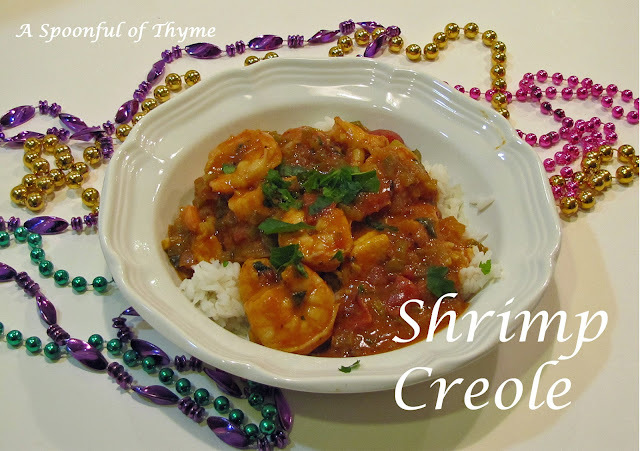 The recipe comes from another New Orleans cookbook that I picked up along the way... Commander's Kitchen by Martin and Shannon. It is filled with tasty recipes that are fun to make and sample! Reduce the vinegar ahead of time, if desired. Bring it to a boil in a small saucepan and cook over medium-high heat until it is reduced in volume to about 1/3 cup, the bubbles seem smaller, and the liquid thickens. Be careful not to burn it. Pour the reduction into a small container and refrigerate until needed. Core, seed and thinly slice one of the apples and place in a small roasting pan. Add the garlic, half the onion, 2 Tablespoons of olive oil, and the salt and pepper and toss to coat with the oil. Bake for 25 to 30 minutes, or until the mixture is brown and tender. Remove from the oven and pour the brandy into the pan, scraping up any glaze that might be clinging to the bottom. Purée the mixture in a blender or food processor, slowly drizzle in the remaining oil, scrape the bowl, and blend the dressing for a few more seconds. Reduce the oven heat to 350° F. Spread the walnut pieces out on a small baking pan and roast for about 15 minutes, taking care not to burn them. Core, seed, and thinly slice the remaining two apples. Toss the watercress, the remaining onion, and the apples with the dressing in a large bowl. Adjust the salt and pepper if necessary. Divide the salad among 8 plates and sprinkle an equal amount of cheese and walnuts over each. Drizzle some of the chilled vinegar around the edge of each plate and on top of the salad. I really enjoyed the combination of flavors in this salad....very light and tasty! 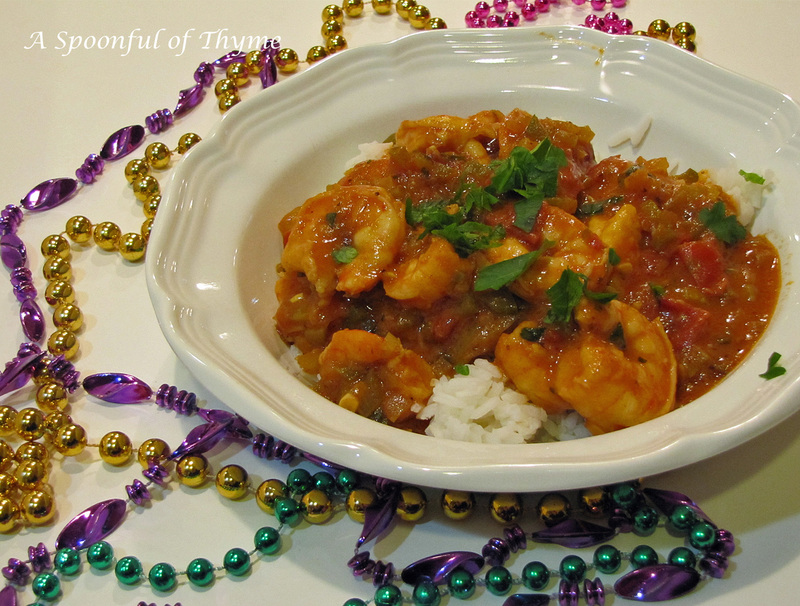 Breakfast at Brennan's and Dinner, Too by Pip, Jimmy and Ted Brennan, Proprietors, was so much fun to read that I had to stop along the way and make a few things....Shrimp Creole appealed as it is February and even though it is just past Mardi Gras, I added it to our February Gourmet Menu. I was certainly NOT disappointed...this was an absolutely delicious recipe with the perfect amount of "heat" given the other dishes on the menu. Melt butter in a large saucepan and cook the bell pepper, onion, celery, and garlic until tender, 5 to 8 minutes. Stir in the tomato paste, paprika, and Italian seasoning and cook an additional 3 minutes. Add 1 1/2 cups chicken stock or water, tomato juice, tomatoes, Worcestershire, salt, black, cayenne and white pepper. Bring the mixture to a boil, then reduce the heat and simmer for 8 to 10 minutes, stirring frequently. In a small bowl, blend the cornstarch with 4 tablespoons water until smooth. Gradually add the cornstarch to the mixture, stirring constantly, until the sauce thickens. Add the shrimp and parsley to the sauce and bring to a boil. Lower the heat and simmer for 5 to 8 minutes until the shrimp are cooked through, do not overcook. Sprinkle with parsley and serve over rice. In my book, this is another great comfort food that goes on the rotation! The leftovers were wonderful, too. When I was working and had to travel, I always picked up a cookbook specific to the area I had visited. On a few occasions, I traveled to New Orleans...so, since it was February, Mardi Gra time and I was preparing the menu for out gourmet group....I pulled out Breakfast at Brennan's and Dinner, Too by Pip, Jimmy and Ted Brennan, Proprietors. While we always have appetizers to accompany our wine or cocktails prior to dinner, we sometimes enjoy the addition of a more formal appetizer...one that is served at the table. These seafood crêpes with a Hollandaise sauce were delicious! The chef even prepared some pickled zucchini and carrot strips as a garnish....so tasty!! Melt the butter over low heat in a large sauté pan, then add the crabmeat and 2 tablespoons water. Season the crabmeat with salt and pepper and cook until heated through, about 5 minutes. Fold in the shrimp and briefly warm the mixture. Place the crêpes on oven proof plates. Fill the center of each crêpe with about 1/4 cup crabmeat and 2 shrimp. Roll the crêpes and top with 1/4 cup Hollandaise and 1 tablespoon Parmesan cheese. Broil the crêpes until the cheese melts, about 1 to 2 minutes, and serve immediately. Preheat a 5 inch crêpe pan or skillet, and brush it lightly with melted butter. Pour about 2 tablespoons batter into the pan and tilt the pan to spread the batter evenly over the bottom of the pan. Cook the crêpe over medium heat until golden brown, about 30 seconds, then turn the crêpe and brown the other side. Repeat the procedure with the remaining batter, making about 16 crêpes in all. 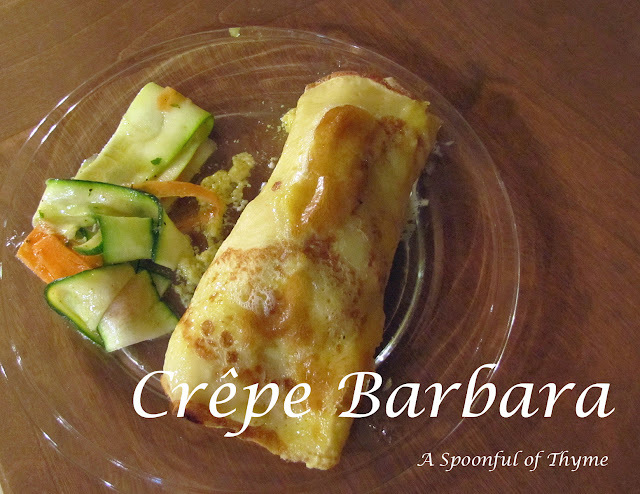 The crêpes can be sealed in plastic wrap and frozen for several weeks. Melt the butter in a medium saucepan, skim and discard the milk solids from the top of the butter. Hold the clarified butter over very low heat while preparing the egg yolks. Place the egg yolks, vinegar, cayenne, and salt in a large stainless steel bowl and whisk briefly. Fill a saucepan or Dutch oven large enough to accommodate the bowl with about 1 inch of water. Heat the water to just below the boiling point. Set the bowl in the pan over the water; do not let the water touch the bottom of the bowl. Whisk the egg yolk mixture until slightly thickened, then drizzle the clarified butter into the yolks, whisking constantly. If the bottom of the bowl becomes hotter than warm to the touch, remove the bowl from the pan of water for a few seconds and let cool. When all of the butter is incorporated and the sauce is thick, beat in the water. Serve the Hollandaise immediately or keep in a warm place at room temperature until use. 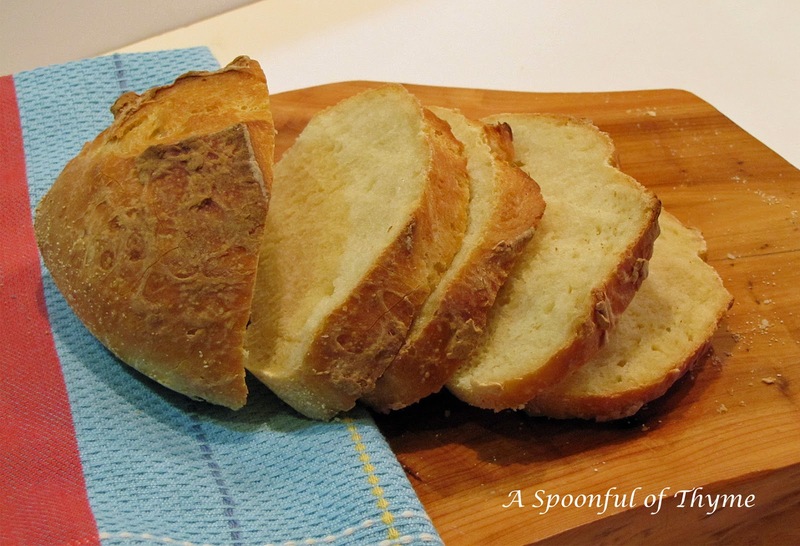 My very first blog post in 2009 was about this bread. 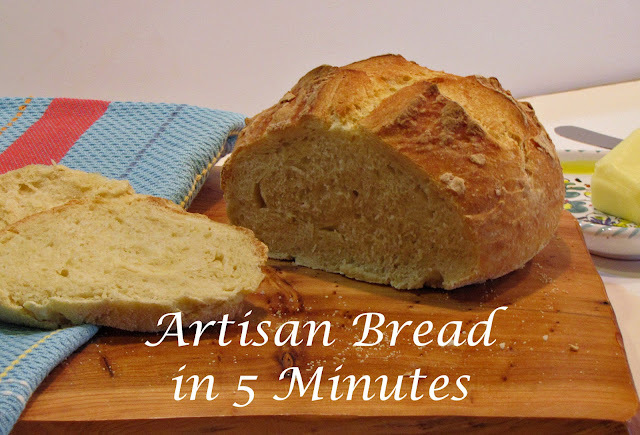 I had just gotten the cookbook, Artisan Bread in Five Minutes a Day by Hertzberg and Francois. It wasn't a wonderful post...and the picture left a lot to be desired! As I recall, my daughter and SIL had just moved to Seattle and I went up for a visit....since we enjoy cooking together, this was going to be our "fun thing to do". It was a delicious bread and I knew that I would be making it in the future! It is simple...the process involves mixing up the dough, letting it raise for two hours and then pop it into the refrigerator to use within 14 days. One recipe makes four small loaves... You may get the recipe here along with great visuals if you are making the bread for the first time. I am off to the kitchen to make another batch of dough! 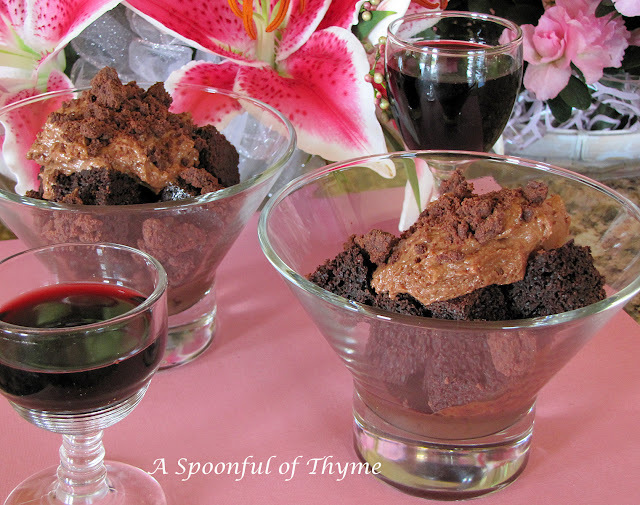 I am revisiting two desserts that are perfect for Valentine's Day...just the right amount of chocolate and flair! Both were delicious!! Preheat oven to 350°. Spray 2 mini-muffin trays (12 muffin cups each) with cooking spray. In a food processor, whirl cookies into fine crumbs. Measure; return 1 1/2 cups crumbs to food processor, along with 1/4 cup plus 2 tbsp. sugar, the salt, and 1 egg white. Pulse to blend evenly. Spoon 1 tbsp. crumb mixture into each muffin cup. Press crumbs over bottom and up sides of cups. Bake until set, 15 minutes. Put chocolate and butter in a microwave-safe container and heat in 30-second intervals, stirring often, until melted. In a small bowl, combine 1/4 cup sugar, the cornstarch, and 4 tsp. cocoa. Pour in a few tbsp. of the milk and whisk into a smooth paste; whisk in remaining milk. Transfer to a small saucepan and cook over medium heat until thickened and large bubbles appear, about 3 minutes. Put reserved yolk and remaining egg into a medium bowl. Whisk in about 1/2 cup hot milk mixture. Scrape egg-milk mixture into milk mixture in pan and cook, whisking, until just starting to boil, about 30 seconds. Whisk in melted chocolate and butter. Spoon hot filling into chocolate shells. Press plastic wrap over surface of mini pies to prevent a skin from forming. Chill until set, at least 1 hour and up to 2 days. Remove pies from trays. Whisk cream with remaining 2 tbsp. sugar into soft peaks. Spoon a dollop of cream onto each mini pie. Dust pies with remaining cocoa. The second chocolate delight was more than two bites...four layers, actually....but it was worth every effort and every bite!! Pour the batter into the prepared cake pan and bake until a toothpick inserted in the center comes out clean, about 50 minutes. Cool on a rack for 15 minutes. Invert onto the rack, remove the parchment, and cool completely. Divide the warm chocolate sauce among twelve 8-oz. glasses. 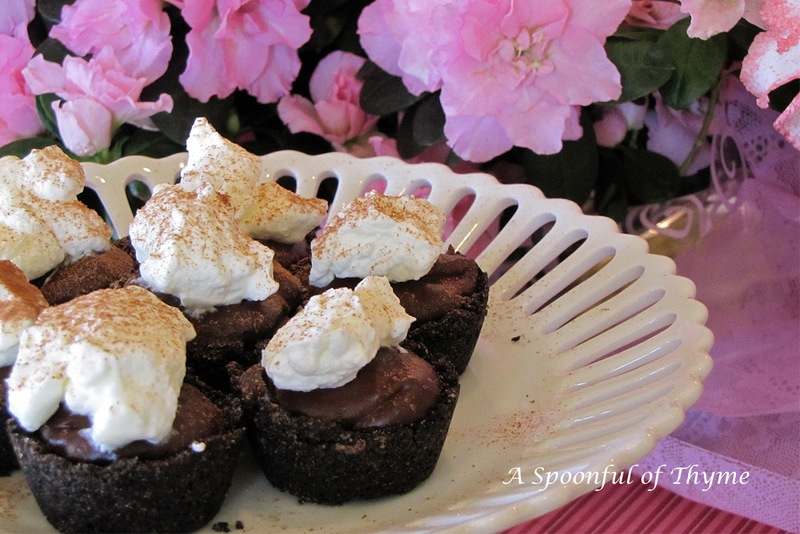 Cut the cake into 1-inch cubes and put 4 in each glass. Drizzle 1/2 tsp. of the rum on the cake cubes. Scoop a spoonful of mousse into each glass. Sprinkle about 2 Tbs. of streusel on top of the mousse, and serve. What makes a cake Armenian? Good question. You can imagine my surprise when I excitedly told my neighbor that I was making an Armenian Nutmeg Cake and she responded with, "I don't think there is such a cake." My neighbor who is an Armenian cook par excellence checked all of her cookbooks for me...there was no mention of a Nutmeg Cake. I researched Armenian cooking to see which spices were most often used when preparing sweet dishes....cinnamon was the winner. My neighbor talked to her mom and her sisters...they had never heard of it. 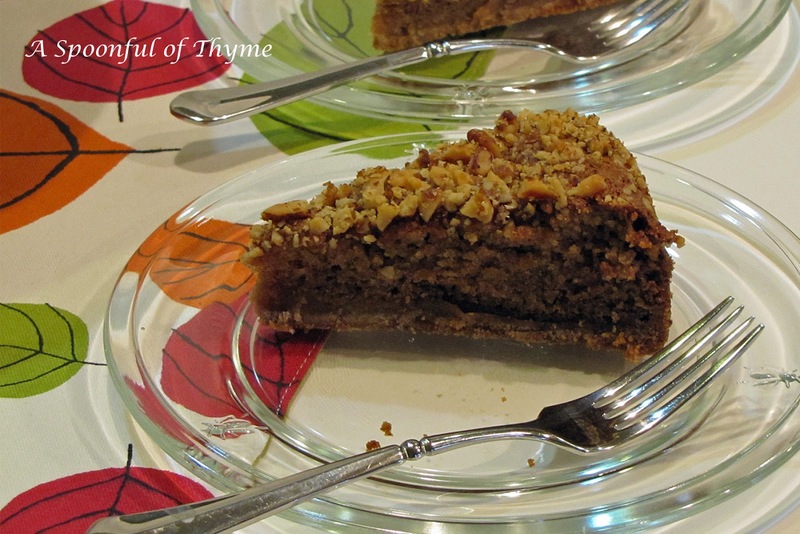 I did find a Walnut Cake..maybe that morphed into this fabulous Nutmeg Cake. Who knows? Whatever its origin, it meets the taste test....my neighbor even requested the recipe so she could make it for her mom. 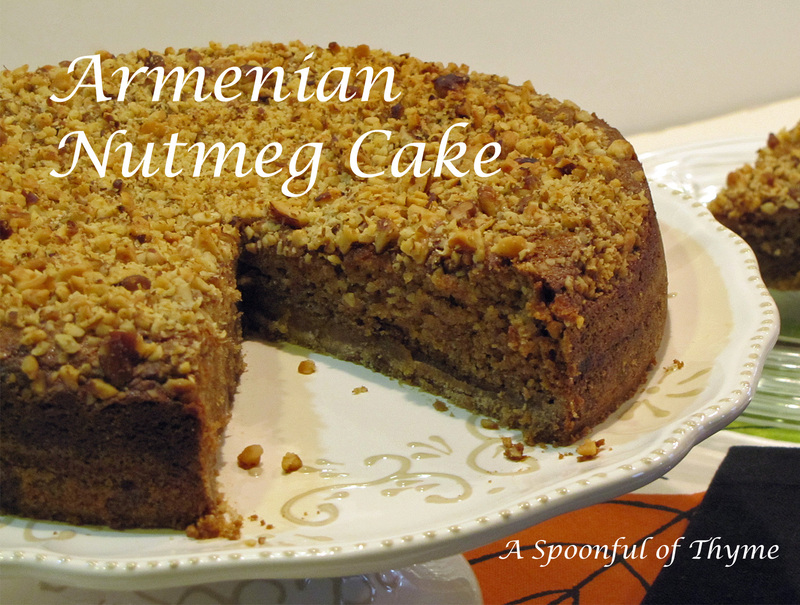 Armenian or not Armenian, this cake meets the taste test! Could I have another slice, please? What, it is good for breakfast, too? That works for me! And why would I be making an Armenian cake? Well, today is reveal day for the Secret Recipe Club and I was assigned Susie's wonderful blog, Eat Little, Eat Big. Susie's blog is all about "striving to eat healthy without sacrificing the pleasures of good, tasty food and the occasional splurge." I must admit that I really struggled to select a recipe...there were so many that appealed to me. 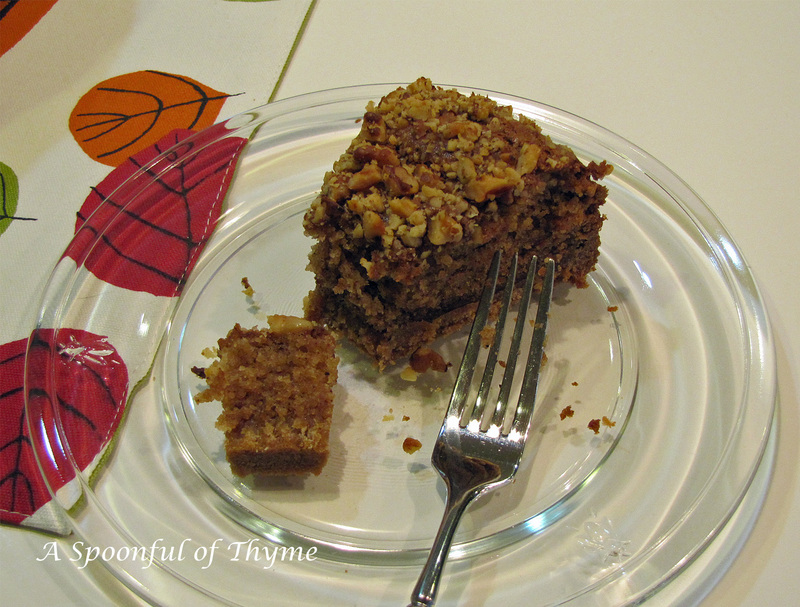 I looked at the Chicken Curry and the Greek Salad but the Armenian Nutmeg Cake won! I will be visiting Susie often but since she is on Maui, I will have to limit myself to desk chair visits! This cake can double as a dessert or a breakfast cake. It has two wonderful layers. The bottom layer is a mixture of brown sugar, flour and butter. It is firm and a great base for the cake layer which has a delightful crumb. Susie discussed that some bakers had issues with the nuts migrating to the bottom or that it wasn't done in the allotted baking time. Looking at the ingredients I did a little adjusting. Instead of using 1% milk, I substituted sour cream...I used a whole egg instead of just the white. Okay, I missed the healthy point......but...it was so delicious.....and I only ate it for dessert and for breakfast....twice. Press half of this mixture evenly over the base of the prepared pan. Reserve the other half. Dissolve the baking soda in the sour cream, add the beaten egg and nutmeg, then the reserved mixture. Combine well. Pour into the pan and sprinkle the nuts and some cinnamon, if desired, over the top. Bake in the oven for 45 to 60 minutes. Start testing for doneness at 45 minutes. My cake was done at 45 minutes. You won't be sorry that you made this delightful cake!! 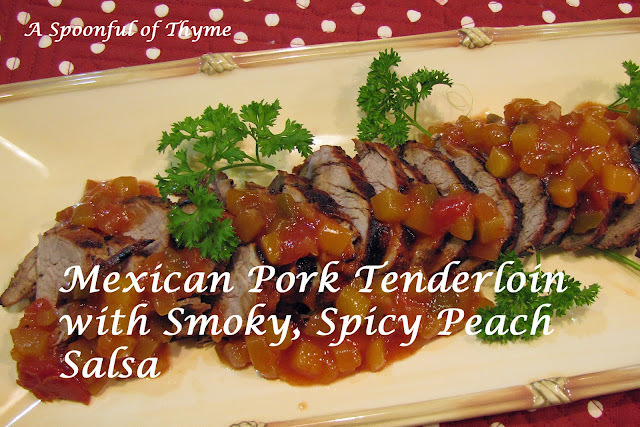 I hesitated to pull the pork tenderloin from the freezer as I knew it would be cold outside for grilling. Mr. T didn't see it as a problem so, pork tenderloin for dinner! 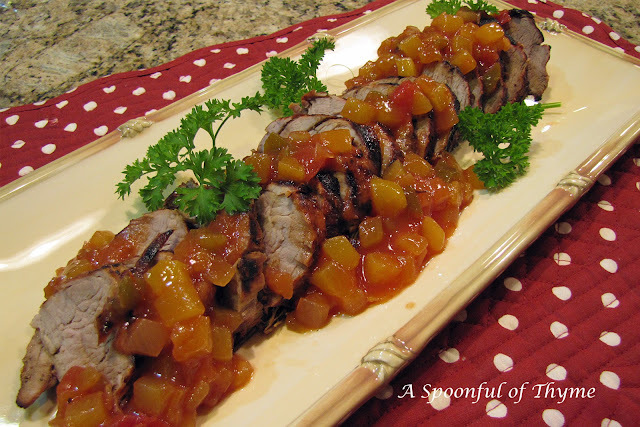 Paging through Pacific Fresh by Maryana Vollstedt I found a recipe that I had marked as great and very flavorful and since I had everything readily available, Mexican Pork Tenderloin was what I prepared. The recipe calls for Black Bean Salsa but I elected to pull a jar of Trader Joe's Smoky, Spicy Peach Salsa from the cupboard....goodness, I am sounding like Sandra Lee! But, truly, everything doesn't have to be made from scratch...at least in my world...but, for those of you who must do it yourself, you might want to check this out. Since I didn't try it, I have no idea how close the recipe is to the purchased salsa. 1. Place pork in a gallon zip lock bag. In a small bowl stir together all ingredients fro the marinade. Pour over the pork. Seal, place in a shallow dish and marinate for four hours in the refrigerator, turning the bag several times. 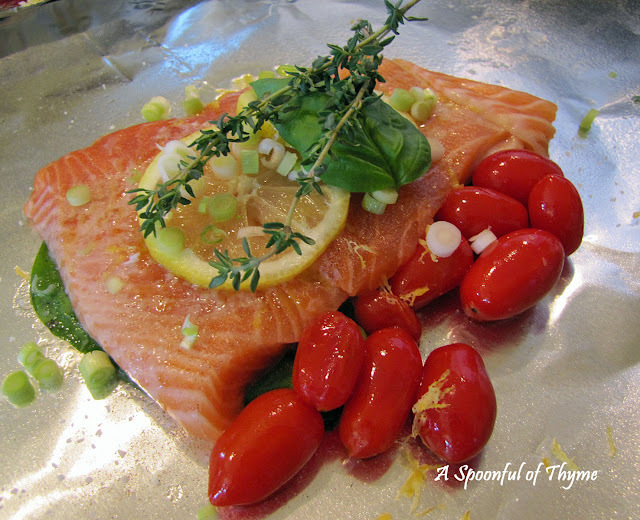 Remove from the refrigerator 30 minutes prior to grilling. Prepare grill. remove pork from the marinade, reserving marinade. Grill, turning several times and basting with reserved marinade, until tender and a meat thermometer registers 160 to 170 degrees, Farenheit. Let stand 10 minutes before carving. Slice across the grain and arrange on a warmed platter. Serve immediately with lime wedges, sour cream and a sprinkling of cilantro. The salsa may be served along side. I am sharing at On the Menu Monday hosted by Yvonne at Stone Gable as well as Foodie Friday hosted by Michael at Rattlebridge Farm.